An amazingly lightweight, maneuverable 'copter that lets you see the world from an incredible overhead point of view. 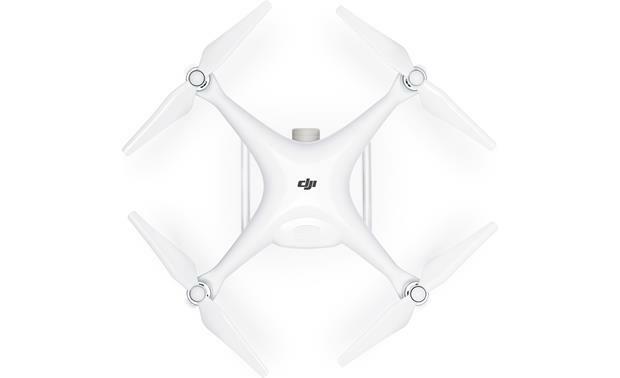 The DJI Phantom 4 Advanced is an amazingly lightweight, maneuverable quadcopter that lets you see the world from an incredible overhead point of view. It carries a powerful 20-megapixel, 4K camera on a steadying gimbal mount, so you can bank and turn and swoop and still record smooth, judder-free video. Three flight modes let you choose which of the drone's capabilities best suit you during any given outing. For most pilots, including first-timers, Position mode offers simple flight controls with plenty of help with navigation and safety assistance. For smoother, more responsive maneuvering during a video shoot, try Attitude mode. And when you're ready to open up the throttle and go for the Phantom 4's top speed, Sport mode gives you maximum piloting control. The included remote controller connects with your smartphone (not included) to enable TapFly mode. Simply use your finger and the device's touchscreen to tell the Phantom 4 Advanced where to go next. If you'll be running, biking, skiing or otherwise occupied, go hands-free with ActiveTrack mode, and the drone will follow faithfully behind as you get your move on. If you're really new to drone piloting, a special Beginner Mode will let you learn the ropes with maximum safety protocols in place. Aerodynamic Titanium & Magnesium Alloy Body: The Phantom 4 Advance drone's titanium & magnesium alloy body reduces weight while keeping stiffness at a maximum to minimize vibration. The Phantom 4 Advance's sleek and aerodynamically designed body minimizes buffeting when flying in strong winds and against gusts from any angle, keeping its movements predictable and precise. The deeply integrated gimbal and the new placement of battery lift Phantom 4 Advance's center of gravity, improving balance, enhancing agility and adding more accuracy to how it reacts to your commands. Flight Autonomy: Equipped with DJI's Flight Autonomy system made up of five vision sensors, dual-band satellite positioning (GPS and GLONASS), ultrasonic rangefinders, and redundant sensors, the Phantom 4 Advanced can hover precisely in places without GPS and navigate complex environments. The dual forward vision sensors can see as far as 30-meters out in front, enable auto brake, and hover or detour in front of obstacles within a 15-meter range. Visions System: The main components of the Vision System are located on the front and bottom of the Phantom 4 Advanced, including two stereo vision sensors and two ultrasonic sensors. The Vision System uses ultrasound and image data to help the aircraft maintain its current position, enabling precision hovering indoors or in environments where a GPS signal is not available. The Vision System constantly scans for obstacles, allowing the Phantom 4 Advanced to avoid them by going over, around, or hovering. Obstacle Sensing w/ Assisted Braking: Powered by the Obstacle Sensing, the aircraft will now be able to actively brake when obstacles are detected around the aircraft. Note that Obstacle Sensing function works best when lighting is adequate and the obstacle is clearly marked or textured. The aircraft must fly at no more than 31 mph (50 kph) to allow sufficient braking distance. 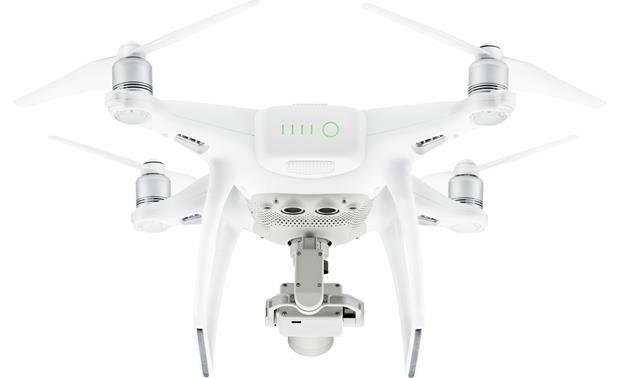 Sensor Redundancy: The Phantom 4 Advanced features dual compass modules and dual IMU units, making it more reliable. Compasses and IMUs are important sensors to ensure a stable flight and the Phantom 4 Advanced constantly compares the data it receives through both pairs. This data is run through advanced algorithms to check accuracy and any inaccurate data is simply discarded without affecting flight, keeping flight steady and reliable. Flight Modes: Different productions require different flight characteristics, and the Phantom 4 Advance offers four modes for flight: P (Positioning), A (Altitude), S (Sport), T (Tripod). Switching between them allows pilots to get the control they need, whether they seek smoothness, simplicity, intelligent navigation or speed. Both the infrared sensing system and vision sensors are enabled in these modes for a safer flight experience. 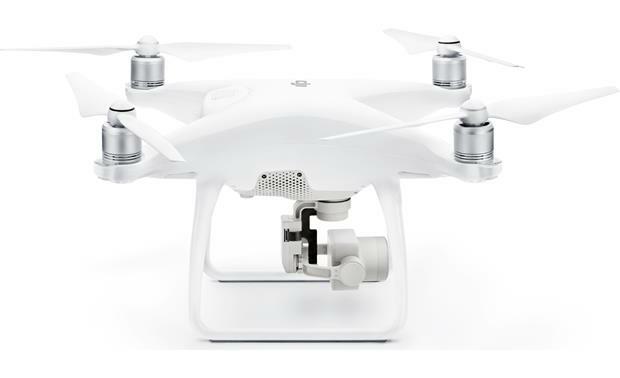 A-Mode (Altitude): Altitude Mode switches off satellite stabilization and holds the Phantom 4 Advance's altitude. It is ideal for experienced pilots looking to capture smoother footage with a maximum speed of 36 mph. T (Tripod): Tripod Mode, which limits speed to 4mph provides precision control for fine framing and indoor flying. Draw: Draw is a brand new technology for waypoint control. Simply draw a route on the controller's screen and the Phantom 4 Advance will move in that direction while keeping its altitude locked. This allows the pilot to focus on camera control and enables more complex shots. There are two Draw modes that can be used in different scenarios - Forward (aircraft follows the route at a constant speed with the camera facing in the direction of flight) & Free (aircraft only moves along the route when instructed. In this mode, the camera can face in any direction during a flight). ActiveTrack: The Phantom 4 Advance automatically recognizes subjects, follows and captures them as they move, making it easier to get complex shots. Following fast-moving objects can be very challenging, but advanced image recognition algorithms used by the Phantom 4 Advance allow it to recognize and track the object while keeping it in frame. This new algorithm also recognizes more subjects, from people to vehicles to animals, and will adjust its flight dynamics to match, ensuring smoother shots. You can choose between 3 ActiveTrack flight modes - Trace (follows behind or in front of a subject avoiding obstacles automatically), Profile (flies alongside a subject at a variety of angles to get profile shots of the subject), & Spotlight (keeps the camera trained on a subject while the aircraft flies almost anywhere). TapFly: Fly in any direction visible on-screen with a simple tap. Tap anywhere on-screen to smoothly adjust the direction of flight while automatically avoiding obstacles and tap the screen again or use control sticks to change direction. A new AR route function shows the aircraft's real-time flight direction for reference as its route is adjusted. As it can be difficult to control altitude, course, speed and camera pitch simultaneously using joysticks, TapFly Free allows a pilot to set the direction of flight, allowing them to turn the Phantom 4 Advance or tilt the gimbal as required without changing the direction of flight. In total, there are two TapFly modes - Forward (tap to fly in the selected direction) & Free (locks the forward direction of the Phantom without locking the camera direction allowing it to turn). Terrain Follow: The Downward Vision System is utilized in Terrain Follow Mode to maintain a height above ground between 1 and 10 meters. This mode is designed for use on grassland sloped at no more than 20°. When this mode is enabled, the aircraft's current height will be recorded. The aircraft will maintain the recorded height during flight and ascend when the slope rises. However, the aircraft will not descend in downward slopes. Gesture Mode: Using Gesture Mode, selfies can be captured easily using a few gestures without the remote controller. Advanced computer vision technology allows the Phantom 4 Advance to take instructions through gestures. The subject simply lifts their arms when facing the camera and the aircraft will recognize this movement by locking on and placing the subject in the center of the frame. When ready for a photo, the subject holds their arms out to signal the aircraft. A three second countdown will begin, making time to strike a pose, allowing moments to be captured without the remote control. Tripod Mode: In Tripod Mode, the maximum flight speed is limited to 5.6 mph (9 kph) and the braking distance is reduced to 6.6 ft (2 m). Responsiveness to stick movements is also reduced for smoother more controlled movements. Additional Flight Settings: The Intelligent Flight modes include Course Lock, Home Lock, Point of Interest (POI), Follow Me. and Waypoints features to assist in capturing professional shoots during the flight. Course Lock and Home Point lock ensure the lock of aircraft orientation, allowing you to focus more on other operations. Point of Interest, Follow Me and Waypoints mode enable aircraft to fly automatically according to the pre-set flight maneuvers. Course Lock: Lock the current nose direction as the aircraft's forward direction; the aircraft will move in the locked directions regardless of its orientation (yaw angle). Home Lock: Pull the controller's stick backward to move the aircraft toward its recorded Home Point. Point Of Interest (POI): The aircraft will orbit around the subject automatically to allow the operator to be more focus on framing their shoot on the subject in Point of Interest (POI). Follow Me: A virtual tether is created between the aircraft and your mobile device with the DGI GO app installed, so that the aircraft can track your movement as you move. Waypoints: Record a flight path, then the aircraft will fly along the same path repeatedly while you control the camera and orientation. Return-to-Home (RTH) + Precision Landing: The Return-to-Home (RTH) function brings the aircraft back to the last recorded Home Point. There are three types of RTH modes - Smart RTH, Low Battery RTH, and Failsafe RTH. The aircraft can even sense and actively attempt to avoid obstacles during RTH, provided that the lighting conditions are adequate for the Forward Vision System (FVS). While landing, the Phantom 4 Advanced automatically scans and attempts to match the terrain features underneath during Return-to-Home (RTH). When current terrain matches the Home Point terrain, the Phantom 4 Advanced will start landing immediately to achieve precision landing. The DJI GO 4 app will show a terrain feature mismatch prompt if matching fails. Smart RTH: In its upgraded Return to Home mode, the Phantom 4 Advance can automatically choose the best route to return home depending on environmental conditions. It records its route as it flies, allowing it to return along the same route avoiding obstacles if the control signal is disconnected. Based on its altitude at the time of disconnection, the Phantom 4 Advance is also able to adjust its flight path to avoid obstacles it has seen during its flight. At takeoff, the Phantom 4 Advance will record the scene below and compare its recording with what it sees as it returns, for more precise landing. It can also detect the ground to see whether there is suitable spot for landing. If any obstacles are found, or there is water on the ground, it will alert the pilot and hover at an appropriate height, helping the aircraft to land more safely. Failsafe RTH: The Forward Vision System allows the aircraft to create a real-time map of its flight route as it flies. If the Home Point was successfully recorded and the compass is functioning normally, Failsafe RTH will be automatically activated if the remote controller signal is lost for more than three seconds. The aircraft will plan its return route and retrace its original flight route home. The aircraft will hover for 10 seconds at its current location. When it regains signal connection it will wait for pilot commands. The Return-to- Home process may be interrupted and the pilot given control of the aircraft if the remote controller signal connection is re-established. Low Battery RTH: The low battery level failsafe is triggered when the DJI Intelligent Flight Battery is depleted to a point that may affect the safe return of the aircraft. Users are advised to return home or land the aircraft immediately when prompted. The DJI GO 4 app will display a notice when a low battery warning is triggered. The aircraft will automatically return to the Home Point if no action is taken after a ten-second countdown. The user can cancel the RTH procedure by pressing the RTH button on the remote controller. The thresholds for these warnings are automatically determined based on the aircraft's current altitude and distance from the Home Point. The aircraft will land automatically if the current battery level can only support the aircraft long enough to descend from its current altitude. The user can still use the remote controller to alter the aircraft's orientation during the landing process. Flight Recorder: Flight data is automatically recorded to the internal storage of the aerial drone. This includes flight telemetry, aircraft status information, and other parameters. To access this data, connect the aircraft to your Windows PC through the Phantom 4 Advance's microUSB port. Carry Case: The Phantom 4 Advance comes with a foam carrying case with handle. 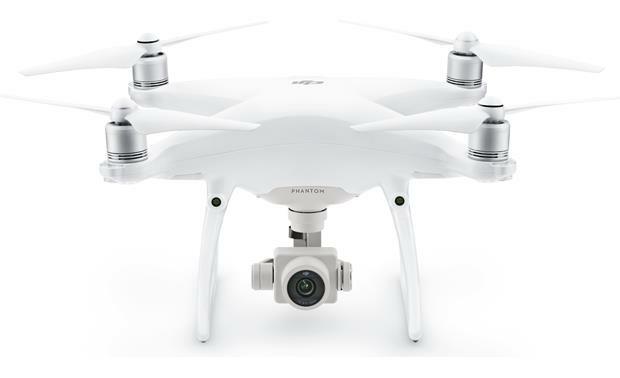 High Performance Camera: The Phantom 4 Advance camera system has been significantly upgraded from the Phantom 4, improving every part of the camera including sensor size, resolution, image processing system, and more, making it the most powerful Phantom camera ever. The onboard camera has been redesigned to use a 1" 20-megapixel CMOS sensor. A custom engineered lens made up of eight elements is arranged in seven groups, it is the first DJI camera to use a mechanical shutter, eliminating rolling shutter distortion which can occur when taking images of fast moving subjects or when flying at high speed. In effect, it is as powerful as many traditional ground cameras. More powerful video processing supports H.264 4K videos at 60fps or H.265 4K at 30fps, both with a 100Mbps bitrate. Advanced sensors and processors ensure everything is captured with more image detail and the image data needed for advanced post-production. 20MP 1" CMOS: Sensor size is more important to image quality than the number of pixels because a larger sensor captures more information in every pixel, improving dynamic range, signal-to-noise ratio, and low light performance. The 20-megapixel 1" CMOS sensor in the Phantom 4 Advance is almost four times the size of the Phantom 4's 1/2.3in sensor. It uses larger pixels and has a maximum ISO of 12800 as well as increased contrast. It is good enough for images to be used immediately, while also capturing enough detail for advanced post-processing. High Resolution Lens: The resolution and contrast of a lens is critical to image quality, because only a quality lens can capture sharp, vivid photos at high resolutions. The brand new Phantom 4 Advance camera has an aerial optimized F2.8-F11 wide-angle lens with a 24mm equivalent focal length. It features eight elements (2 aspherical) arranged in seven groups that fit into a smaller, more compact frame. Its images are consistently detailed with low distortion and low dispersion, ensuring that photos and videos are sharp and vivid. Mechanical & Electronic Shutter: Aerial imaging is not only used to capture landscapes; it brings new perspectives to everything from action scenes to motor racing. Capturing objects moving at high speed has always been a challenge for flying cameras using an electronic shutter. This is why the Phantom 4 Advance is the first DJI Phantom to use a mechanical shutter and a large-aperture prime lens. A mechanical shutter with a max speed of 1/2000s eliminates rolling shutter distortion which can occur when taking images of fast moving subjects or when flying at high speed. The electronic shutter has also been improved with a max shutter speed of 1/8000seconds, and a new Burst Mode shoot capable of shooting 14 fps at 20 megapixels to catch the perfect moment. Gimbal Operation Modes: Two gimbal operation modes are available - Follow or FPV. In Follow mode, the angle between the gimbal's orientation and aircraft's nose remains constant at all times. In FPV mode, the gimbal will synchronize with the movement of the aircraft to provide a first-person perspective flying experience. 4K Video Processing System: An enhanced video processing system allows video to be captured in cinema and production optimized DCI 4K/60 (4096 x 2160/60fps) at a bitrate of 100Mbps, enabling you to get high-resolution slow motion shots. The Phantom 4 Advance also supports the H.265 video codec (Maximum resolution 4096X2160/30fps). For a given bitrate, H.265 doubles the amount of image processing as H.264, resulting in significantly enhanced image quality. Record in the high dynamic range D-log mode to make the most of this image data for color grading. microSD Card Storage: All of your captured photos and recorded videos are stored on a microSD/SDHC memory card (Class 10 or UHS-1; up to 128GB). One 16GB microSD card is included. The photo and video files can then be downloaded directly to your computer via the camera's microUSB port. 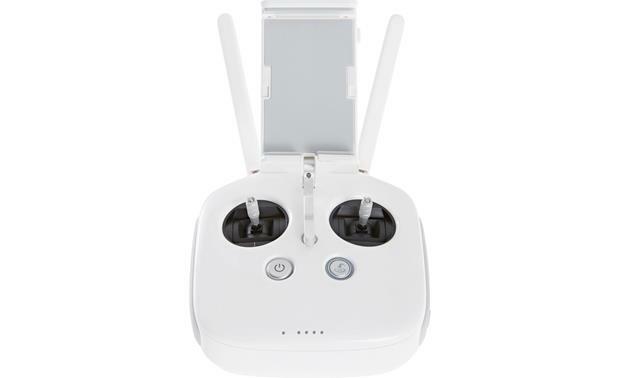 Remote Controller: The included wireless remote controller is responsible for control of the Phantom 4 Advance drone, including piloting and aerial capture, through its joysticks and your docked Apple or Android device running the DJI GO 4 App. Use the controller's joysticks to control the flight pattern of the drone, while the DJI GO 4 app on your mobile device provides a live video feed of the Phantom 4 Advance's gimbal camera. The controller is powered by a built-in, rechargeable 5 hour battery. DJI GO 4 App: Download the onto your Apple iOS 9.0+ or Android OS 4.4+ device to turn your mobile device into a user-friendly interface for controlling the Phantom 4 Advance's camera operation and flight settings. The Phantom 4 creates its own WiFi network that streams a real-time view from the camera to your USB-connected mobile device. Use your smartphone or tablet device to frame shots, watch the world below, and see everything from a new perspective. pp is built into the controller's screen, hardware and software can be fully optimized, allowing you to edit and share instantly. Flight Functions: Using the DJI GO 4 app, a large number of Intelligent Flight Modes are available. Vital flight data and video transmission status are easy to check in-app, further enhancing control efficiency and convenience. After each flight, flight routes and data are automatically recorded and synchronized to the attached DJI GO 4 account, keeping it readily accessible for you to review. Both flight logs and data are easy to record and review. Camera Functions: The app also provides access to full manual camera controls, including ISO, aperture, shutter speed, image formats, and more. In addition, the DJI GO 4 app includes editing features for quick editing and sharing to social media and even live streaming. Lightbridge Video Transmission System: The Phantom 4 Advance utilizes an upgraded Lightbridge HD video transmission system for live video feed between the aerial drone's gimbal camera and the controller's built-in monitor. The Lightbridge video transmission system uses advanced transmission technologies and can automatically adjust to environmental conditions. It ensures high quality, low latency image transmission across its range and offers pilots a better shooting experience. Traditional analog video transmission occupies a larger bandwidth and is more susceptible to interference. It also suffers from poor image quality and short range. WiFi transmission also compares poorly, suffering from low latency, lengthy re-connection times, and short transmission distances due to the high cost of more powerful Wi-Fi transmission.